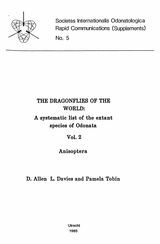 This is the partner volume to the Zygoptera species list and the general comments in the Introduction to Vol.1 with regard to the preliminary nature of the listing apply equally to this Anisoptera list. We have attempted to include what is in the literature and not give our own opinions too much prominence. Nevertheless some subjective choices have been made. We have used a modified version of the generic synopsis (S.J.O. Rapid Comm. No.3, 1981) as the present framework. Authorship of suprageneric taxa is not included because terms and forms of terms have, in many cases, been used several times by different authors but in different ways. Aeshnoidea. , Polycanthagynini. , Leucorrhiniinae. , Anactini. , Gynacanthini. , Brachytronini. , Corduliinae. , Hageniinae. , Petaluridae. , Libellulinae. , Zygonychinae. , Aeshninae. , Urothemistinae , Gomphomacromiinae. , Zygonyx torridus , Gomphaeschnini. , Tetrathemistinae. , Brachydiplacinae. , Cordulegastroidea. , Gomphidae. , Onychothemistinae. , Neopetaliidae. , Octogomphini. , Petalurinae. , Palpopleurinae , Tanypteryginae. , Lindeniinae , Idomacromiinae. , Trameini. , Trithemistinae. , Cordulephyinae. , Aeshnini. , Cordulegastrinae. , Synthemistinae. , Libelluloidea. , Sympetrinae. , Gomphinae. , Anisoptera. , Chlorogomphinae. , Neophyinae. , Zyxommatini. , Brachytroninae. , Libellulidae. , Gomphini. , Aeshnidae. , Trameinae. , Corduliidae. , Macromiinae. , Cordulegastridae. , Idionychinae. , Rhyothemistini. , Onychogomphinae. , Gomphoidinae.